Karma Yacht Sales Featured on N~Beat "Taking Care of Business"
We are very blessed by the support of our customers and the local Lake Michigan Sailing Community. 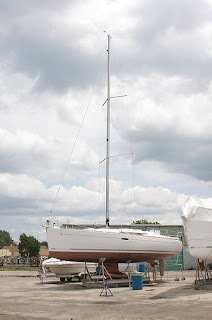 As we complete our eighth year of business as your Lake Michigan Sailboat Dealer Specializing in Beneteau, we know that it would not be possible without your support, encouragement as well as that of our family and friends. We were fortunate to have the "Karma story" and vision of one of the founders of Karma Yacht Sales- Lou Sandoval, told on a recent episode of the show- Ñ Beat. Hosted by Theresa Gutierrez and Produced by Edgar Vargas , the segment titled "Taking Care of Business" ran March 27th on ABC-TV Channel 7. The segment profiled the stories of six entrepreneurs who have taken risks and chosen the roads less travelled (if you may) in pursuit of the 'American Dream'. We have included the segment in the enclosed link in hopes that you will learn a bit more about why Karma Yacht Sales is unique and not just another boat dealer. Our belief is that anyone can sell you a boat- but our goal is to have you become a customer for a lifetime. "The N Beat" is available on-demand at www.abc7chicago.com . 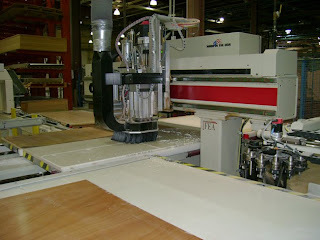 The CNC wood machine works to custom cut wood cabinetry pieces with minimal waste and high efficiency. Beneteau USA recently hosted its annual dealer council/service council in which some key dealers helped chart the future course of the #1 leader of sailing in America. At this year’s council, held after months of transformation of the Marion factory, the plant was revealed to an overwhelming response of amazement from each dealer. 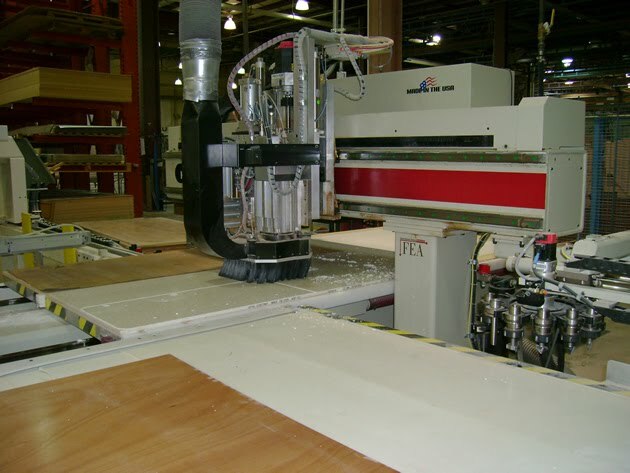 There has been tremendous change at the plant beginning with a huge investment in a new CNC machine driven woodshop and a complete overhaul of all production areas. 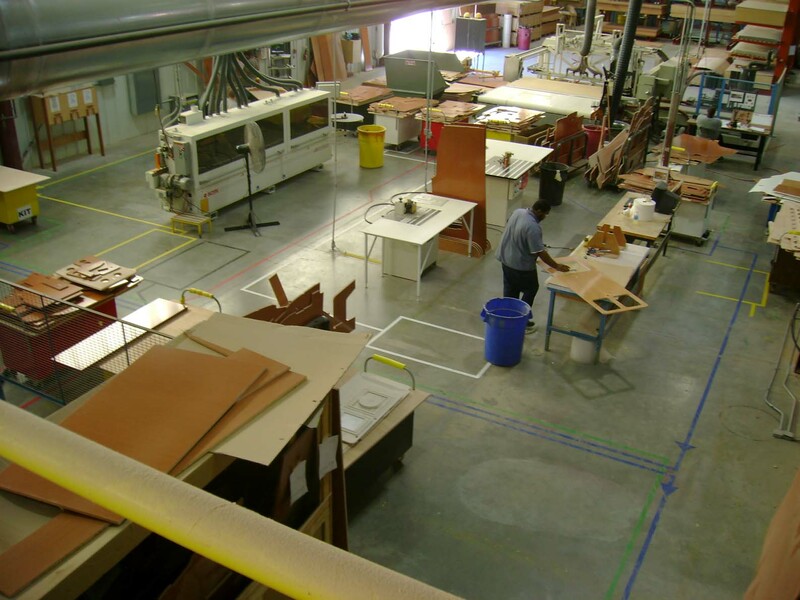 Beneteau USA Inc. has successfully reorganized its 250,000 square foot facility into the most modern big sailboat factory in America. Team members have transformed the 25 year old factory from the past style of eight independent production lines into a new, single line, continuous flow production facility comprising 20 operation positions. The outcome of this new way of building will allow shortened lead times, less work in process and greater flexibility in model mix. The Marion plant is now the only American sailboat plant able to build anything from 30 footers up to 50 footers, all in the same single production line with a lean manufacturing, just-in-time process, bringing the customer better value and quality. “This is an amazing feat for our team, as it truly was an internal initiative that came from the leadership of our Vice President of Manufacturing, Gerard Martineau, working with the full spectrum of production from managers to those on the floor. They have developed a system that is unique in our end of the industry and will eliminate wasted time while improving quality and flexibility. Plus now from the wood shop on to a finished floating dream, we can proudly say it is all made in America.” said Wayne Burdick, President of Beneteau USA. “I’m very proud of our Marion team members and the incredible job they did to transform the existing factory in this new mode of manufacturing, as the majority of the work was done with in-house talent. Throughout the past few years, we’ve gone to school together to learn about lean manufacturing, work flow, and value stream mapping; the results prove that the end justifies the means. This new production style combined with our great team of boat builders will launch Beneteau USA into a new era of excellent quality and quick delivery, continuing Marion’s claim of being the largest producer of sailing yachts on this continent,” stated Mr. Martineau. A review of the innovative changes in boat manufacturing that have taken place in this new millennium. Changes that have made sail boating more accommodating for newcomers to the sport and have incorporated electronic and green technologies. Presenters: Mike Thoney, Jack Buoscio and Lou Sandoval from Karma Yacht Sales. March 22, 2010 -- Hosted by Theresa Gutierrez, with special contributions by ABC7's John Garcia and Stacey Baca, THE N BEAT is an Emmy Award-winning series celebrating the accomplishments of Chicago's Latino community. 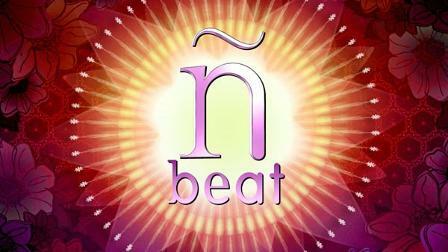 N BEAT: "TAKING CARE OF BUSINESS" will air Saturday, March 27 at 6:00 p.m. with an encore presentation on Sunday, March 28 at 2:00 p.m. This edition of THE N BEAT will profile Latino entrepreneurs, who despite a lackluster economy, have succeeded in establishing thriving businesses here in Chicago. Alicia Gonzalez is an avid marathon runner and the Executive Director of Chicago Run. Her love of the sport was part of the reason she launched the running program currently in place at 30 Chicago public schools. Lou Sandoval is the co-owner of Karma Yacht Sales. Sandoval is the only Latino with a dealership in the Midwest specializing in Beneteau yachts and sailboats. Sandoval talks about his youth as a Boy Scout and credits that experience with sparking his passion for sailing. Diego Rocha is a Brazilian-born artist who, while making Chicago his home, also made a name for himself designing women's handbags. Rocha shows off his beautifully designed custom handbags from his Chicago studio. Nancy Andrade is the President and General Counsel of Mexifeast Foods, Inc. the family business she founded in 2003. Nancy shares her story about how she brought authentic Mexican tamales to Whole Foods and Jewel-Osco Stores. Roman Villareal is a sculptor with 30-yea<>plus of experience carving stone, alabaster and, more importantly, a legacy in South Chicago working with youth at the South Chicago Arts Center. A former steelworker, we get an intimate look at the artist at work in his studio. Ricardo Salazar began his internet company "Arte Salazar" to market his custom handmade Jarana guitar. The guitar gives Son Jarocho, which is the folk music of Veracruz, Mexico, its distinctive sound. From a hollowed out piece of mahogany, Ricardo crafts new instruments from his home in Logan Square. One of the great things about our job is seeing customers "grow into their boat ownership". A boat is different things to different people, but when you meet as many passionate owners as we do- one thing is certain- It is the place were their memories are created one sail at a time. With today's technology, weblogs have become the modern ship's log-where you can chronical the many adventures aboard your Beneteau. One such Journal is that of Endeavor a 2008 Beneteau 37 owned by the Gallagher family. Weblogs can be started via free websites such as http://www.blogger.com/ or www.wordpress.com . You can customize them to suit your purpose and share your many adventures with family and friends.